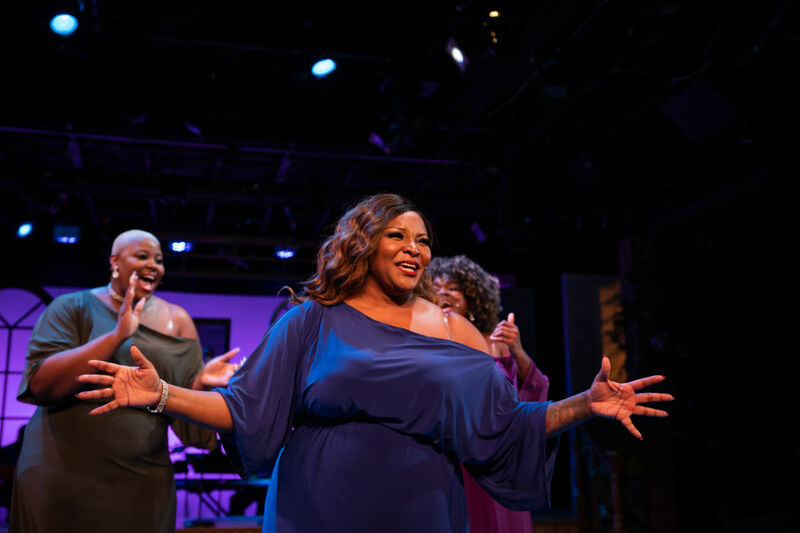 Syreeta Banks, Teresa Stanley, Jennifer Massey and Micresha Myatt in Love Sung in the Key of Aretha. 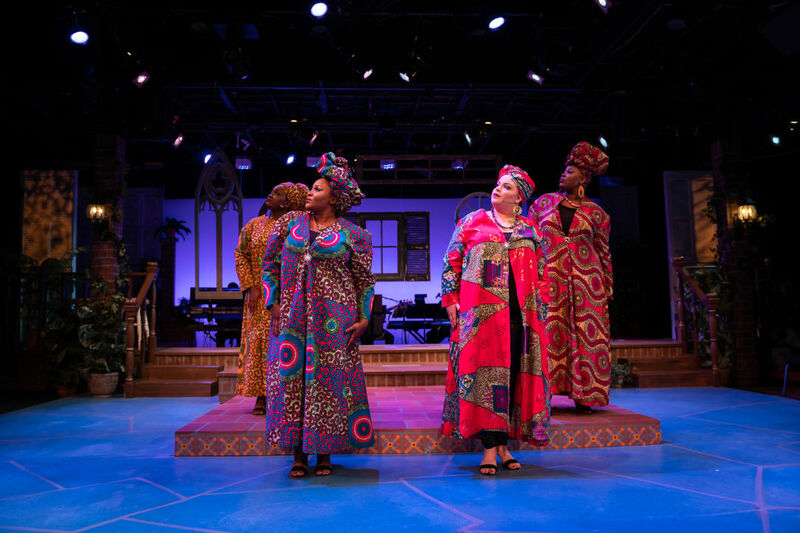 There isn’t much of a storyline to Westcoast Black Theatre Troupe’s season-closing show, Love Sung in the Key of Aretha—and that’s actually a good thing. In a previous version of the show (created by WBTT artistic director Nate Jacobs), back in 2011, there was an attempt to weave together events, both personal and public, in the lives of four women with songs the late, great Queen of Soul, Aretha Franklin, made famous. There’s less of that in this revamp, allowing the music itself to dominate, while those four ladies also share a few details about Aretha’s life and what her music has meant to them and to others. The four are Carolyn (Teresa Stanley), Erma (Micresha Myatt), Louise (Syreeta Banks) and Barbara (Jennifer Massey), but their names don’t really matter. What we do get a sense of is how they responded to the songs of Aretha when it came to the relationships in their lives (mostly romantic ones) and to the call of civil rights in the 1960s and 1970s. Teresa Stanley, in the foreground, in the WBTT show. The four (three are African-American; the fourth character, played by Massey, is Caucasian and apparently Jewish) also take a little time to deliver hard-won wisdom to a younger woman, Destiny (played by Jai Shanae), who’s in the throes of first love with Darin (WBTT regular Michael Mendez). Robert Richards Jr. is the only other male in the cast, popping up now and then to lend comic support as perhaps the most important man in Erma’s life. The show starts off with the foursome offering a few of Aretha’s most well-known songs, like “You’re All I Need to Get By” and “(You Make Me Feel Like) A Natural Woman.” Their voices are fine, and better than fine, as the rest of the evening demonstrates, although sometimes the hand movements and poses they employ feel predictable and repetitive. But the evening delivers a good blend of Aretha’s sounds, from gospel to bluesy to rousers like “Chain of Fools” and, of course, finally, “Respect.” There are upbeat moments like “Brand New” and “I Say a Little Prayer (For You)” and moments that get right to the heart, like “All the King’s Horses” and “Ain’t No Way.” Whether mixing their voices in satisfying harmonies or standing out on solos, the leads impress with their range and power. 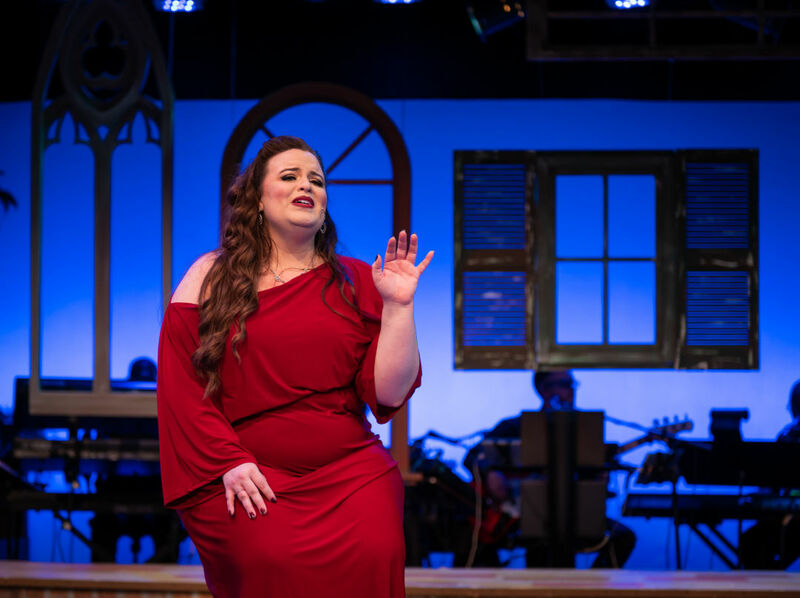 Backed with strength and spirit by music director James E. “Jay” Dodge II and his band, the cast does indeed at times make the rafters ring in WBTT’s home—which, will by, the way, close after this show for renovations before reopening in January for the troupe’s 20th season. Quite a sendoff on view here. Love Sung in the Key of Aretha continues through April 28; for tickets call 366-1505 or visit westcoastblacktheatre.org.